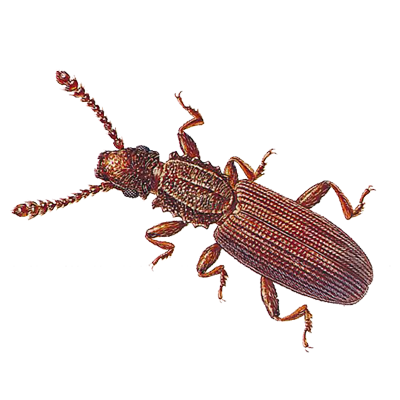 The sawtoothed grain beetle and its look-alike relative, the merchant grain beetle, are slender, flattened, reddish-brown beetles that measure about 1/8 inch in length. They exhibit saw-like teeth along the edge of the prothorax (shoulder area). These beetles feed on a wide variety of foods. While some come in from outdoors, most come in on purchased food, particularly dry pet food. These beetles can enter a home in large and disturbing numbers to feed on food, such as bird seed or pet food, which mice or other rodents have stored in wall voids.